RE8 Pilot with 3RD Squadron A.F.C. "... did the actual observing and signalling. Your aerial gunner is watching all the time for the enemy, and he lets you know if you are about to be attacked. Photos were taken with a camera mounted in the rear of the aircraft behind and under the gunner's seat. The camera for oblique and map making plates was automatically driven and it changed the plates itself. All the pilot had to do was to count the time for exposure and overlap on his stop watch and press the button; the camera did the rest itself. The aerial gunner would change the magazines in the camera on signal from the pilot." "I was on the way back to our aerodrome at Bertangles when I saw many diggers walking along a road and I thought that I would give them a cheer up and decided to fly down to within 50 feet and wave to them, but I noticed that as we waved they were running out of the way off the road and we suddenly realised that we had forgotten to wind in the aerial and it was swinging along the road just over their heads! "The only way to fight with an RE8 was to go into a circle when attacked. You tip up on your side and put your engine full on and as soon as the fellow dived you pulled the stick back and made the circle tight. The German can't get inside and your man can stand and shoot. "Never go into a spin because he can dive down the centre of the spin. You can get into a spiral - you can side-slip if you like - you give yourself opposite rudder and slip down careful that you don't get into a spin." Jack had a chance to use these tactics when at 5.50 a.m. on the 6th of June 1918. Whilst on an artillery reconnaissance about two miles east of Dernacourt with Lieut. N. H. Jones as gunner, he was attacked by an Albatros scout. "The Albatros was well streamlined and they could dive very fast, although they only had fabric-covered wings." Meeting determined resistance, the enemy withdrew. Jack recorded the expenditure of 51 rounds in this engagement. "Most of the German types we were engaged against were Albatros and Fokker scouts, the Fokker Triplane and later the D-VII. Although I did not fly any captured German aircraft, I was there when Armstrong and Mart captured the Halberstadt [model CIII, on 9 June 1918]. It flew up alongside [Armstrong] and the Germans put up their hands in surrender. Armstrong pointed and they glided over to our aerodrome with the German machine-gunner keeping his hands in the air. They landed just as we were changing the guard and the Germans thought that it was a firing squad. Anyway, through a Russian officer we had at the Squadron we managed to talk to them and we took them up to the Officers' Mess and gave them a few drinks. The German pilot had exceeded the required height for his reconnaissance as our "Archie" [anti-aircraft fire] was too hot for him, and it was recorded on the barometers on the wings [of the Halberstadt]; so they thought it was a good idea to surrender. Germany was beaten by then anyhow. "The German airmen were more humane and decent than they were in the second war. There was a tremendous espirit de corps amongst the early type of German airmen and he would give you a good fight for it. They were brave enough and good airmen. "I had two R.E.8s, one nearly to the end of the war. One day I was over the lines and it gave me a bit of trouble; and so while it was being repaired I was loaned another. While over the lines it began to backfire and cough as if it had water in the petrol tank, then it burst into flames under the bonnet over the carburettor. The carburettor on these machines would be approximately 18 inches high by 10 inches in diameter and it blazed up about the size of a four gallon bucket, and was getting larger when I turned off the petrol at the tank and opened up the throttle and the fire went out. I glided down 7,000 feet and landed at Bailleul aerodrome which was situated close to the lines. "This particular machine was kept in the Squadron instead of being got rid of, and it later [12 April 1918] burned to death Lieut. George Best, the pilot and Lieut. Lewis, his gunner whilst they were on a photographic mission from our Poulainville aerodrome. Lewis was two weeks off home establishment leave and Lieut. Best had recently joined the Squadron. It happened near a village in France called Villers Bocage. It was a sad sight. I was sent down to the Abbeville Hospital to identify the bodies and the only way I could do so was the fact I knew them so well. Lewis was a tall man and Best was short and stocky. They were burned so badly their features were unrecognisable. "After my accident with it, the machine should have been put into the Squadron workshop and the engine taken out and thoroughly examined. After the fatal fire, it was examined and it was found that the engine had a twisted cam shaft. There was no reason for keeping it in the Squadron as at time as we had a full complement of aircraft. "After my experience with this particular machine, they sent me down to Auxi-le-Chateau to get a new machine. 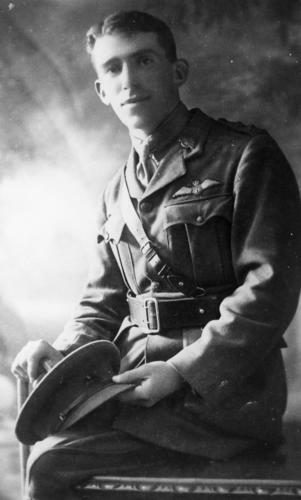 Next day [9 July 1918], McCudden was taking off in a storm and he hit one of the pine trees at the edge of the aerodrome and was killed." Jack's log book records many Line Patrols where he was sent over the lines to spot targets and then convert them into shoots. "We were at 7,000 feet because they were 'Archie-ing' us. "We had been sent over because this battery was causing a lot of trouble and, after we'd spotted the target, about eight rounds from a howitzer fired onto it. When one shell burst in the gun pit, it lifted the gun right out of the pit. We didn't know how many Germans were destroyed but there were fires and cordite burning everywhere. Another time, Wackett was leading a flight and I was one of three with him. There was a German observation balloon near Corbie and we got up close to this balloon when I spotted some dust in the road about two or three thousand yards on the German side and I dived and dropped my bombs on the transport and Wackett tapped out an LL call [LL call means: all available batteries to open fire]. We used Cooper bombs - "daisy-cutters" we called them. We dropped them on infantry, motor transport and trenches where they were open. You would fly along the trench and let them all go in a line." Jack also did a lot of Contact Patrol work and would take six bombs with him to drop on likely targets. On other occasions he dropped phosphorus bombs to provide a smoke screen for the infantry, and, once, containers of ammunition on parachutes designed by Capt. L. J. Wackett. Jack states that they were not always a success as the wind carried them into the German lines. "I couldn't take off, as I hadn't enough petrol for the RE8; when it was on the ground, had its nose up high and the petrol tank ran back. I didn't know how to get a message back [to the Squadron] as there was no one there, but after a while hundreds of diggers came along. I got slapped under open arrest for landing beside the German, for although he'd come down on our side, the landing may have given the position away and when the crowd gathered the German artillery may have opened up. I managed to get a message away by getting Jones to hold the aerial on a piece of rubber and the Squadron sent a plane over which spotted me and they then sent a tender out with petrol. I flew the machine back and had the Spandau machine gun and camera from the L.V.G. as souvenirs. I was released from open arrest the next day when I had explained to the Squadron Commander, who gave me a severe reprimand." Jack did not have an opportunity to fly the Bristol Fighter whilst they were with 3 Squadron. "The Bristol Fighter was a wonderful thing. We were only given Bristols when the Hindenburg Line was to be broken and then they only let us have them for about three or four weeks and then they took them away again; just let us do all the photographic dirty work and then the British took them back. If we had had Bristols in the early days the Huns would have got a lot more than they got. One day coming back from the lines, I did see a number of Bristol Fighters - there must have been 21 of them - and were coming back fairly high when attacked by German fighters and within a few minutes there were German aircraft coming down in flames everywhere. The Bristol Fighters cleaned them up and the rest cleared off for their lives. You never saw anything more efficient than a Bristol Fighter in the air. I think that Captain Brearley and Capt. Wackett flew the Bristols with 3 Squadron." Unfortunately the Squadron was to soldier on with their RE8s until the Armistice. Jack recalled a photographic patrol of the morning of 6 May, 1918. "Captain Henry Ralfe was patrolling the sector adjoining me and there was a low mist at about 3,000 feet and thin. I could see Ralfe in his sector doing his work. Then I saw a bunch of Huns above the mist - they wouldn't attack you under the mist for although slow, the R.E.8 was pretty hot stuff and would fight off two or three of them [Germans] sometimes. But they broke through the mist and Ralfe was attacked by five German machines over Morlancourt Ridge. The machine went down in flames and buried itself 15 feet in the soft ground of the Somme, but Lieut. W. A. J. Buckland, the gunner, jumped out rather than burn. It was a bad show not having parachutes in those days, but the idea was we would jump if we had to ... no fear of that. And when you got into a fight your eye was on the telescopic sight and you were moving into position to get the fellow who was out to get you." Returning to Australia after the War, Jack stayed with aviation. He bought Bert Hinkler's Avro 'Baby' - which is preserved in the Brisbane Museum - and was the first to take an aircraft to many country towns, landing in the main street of Junee. He spent some time in New Guinea where he founded a tobacco factory. During the Second World War he served in the Army and was a Captain in charge of all the anti-aircraft guns, motor transport and field guns north of Sydney Harbour, to the Hawkesbury River. in the Balonne Beacon, (St. George Qld. ), 31 March 1960. One of the earliest air pioneers of these parts was Jack Treacy who toured Queensland and New South Wales in 1922 seeking funds for an aircraft manufacturing company whose chief weakness lay in the fact that it was 20 years before its time. I thumbed a ride with Jack – St. George to Sydney – in those days in what I believe was the first ever flight over this route. There was a spare seat and no takers. Here one realises that Cobb & Co. coaches and the aeroplane existed side by side for a time. Jack was to pick me up at Talwood and I arranged to travel by coach and train to the rendezvous. There I made the intimate acquaintance with the machine in which he had flown so many thousands of miles. Jack was a vintage pilot of World War I, but I never heard him speak of it. Now pioneering civil aviation at a time when there were probably not more than three aerodromes in Australia - no meticulously careful D.C.A., no radio, no landing grounds, no funds and no danger of collision with other aircraft. Jack wended his way through the country trying to sell flying. The machine was an Avro 504K looking like a larger version of a Tiger Moth, top wings staggered at a rakish angle, no flaps, no brakes, no gimmicks, a Sunbeam engine of a stupendous 100 h.p. and a car type radiator with a hole in the centre for the prop to stick through. After a pre-flight party (parties were a feature of the flight) I found myself next morning alongside G-AU(blank space); perhaps somebody forgot to fill in the rest; it probably wasn’t registered anyhow – who would care? by 3 Squadron veteran Nigel Love at Mascot NSW. Surprisingly enough I was to share the passenger seat with a charming lady – at any rate I offered the charming lady the seat and contented myself with sitting on top of the suitcases between her and the pilot up front. The ports may have been strapped in – I wasn’t. From a paddock two miles on the Nindigully side of Talwood alongside the main road we roared off into the blue. The weather was kind, not once during our trip did it threaten us seriously. In what seemed a twinkling of our 80 m.p.h. more or less, we were at Thallon. Where to land? Well that paddock near the road north of the railway looked good. We made it and spent some time selling flights to local residents. However these bluegrass tussocks got Jack a bit rattled after a time, and he “gave it away” to the obvious disappointment of some visitors from the outlying stations. An early start next day for Collarenebri, with a landing at Goondibluie Station en route was the flight plan. There was said to be a fair claypan there. Made a nice touchdown and, after morning tea at the homestead, Jack took some of the station people for a flip. No need to stop the motor, it got cranky to start when hot. I hurried the charming lady aboard and the not so charming ports, and off we went out over the scrub and prickly pear. Before long I realised that Jack was returning towards some open claypans; next - off goes the motor and down goes the nose in an obvious landing approach. I was terribly tempted to whack Jack on the shoulder and say “What’s wrong old boy” when I realised the situation was fairly grave and that he may not appreciate it. When we pulled up we realised a film of dirty castor oil covered everything, including ourselves. The flared fitting on the oil-pressure gauge had given out and all the oil had been pumped out of the tank. Seizing of the motor was only a few revs away. “Well that mucks everything”. The station car rescued us. They billeted our lady in the homestead and Jack and me in the jackeroo’s quarters. A piece of copper wire, a soldering iron and much enthusiasm in the station workshop and we were off again next day. The prickly pear didn’t claim us after all and we made Collie in good time. A day there and some further strengthening of the fitting by the local garage. After a hearty run-up on the - I nearly said tarmac; "dust-mac" perhaps - and after Jack had held his beloved G-AU__ down hard enough to clear underneath the telegraph wires, we were away. Brewarrina was a long while in showing up, so much so that after a couple of wheezy coughs by the motor, Jack suggested that I turn on the auxiliary tank. Still no Brewarrina and Lake Narran still to be crossed (visions of ditching). However a station appeared below on the bank of a river and “with a little bit ‘o luck” we might get in between those wilga trees on that race track or whatever it is – we did. Now for a two-mile trudge back to the station. We did that too. Yes. The road map had not deceived us, this was X station (the name, alas, eludes me after 36 years). Chief features of the place were four huge pepperina trees on a well-kept lawn, and a hospitable manager who obliged us with two tins of Pratt’s Naptha and a friendly jackeroo who took it to the plane in his side-car outfit. Off again into a hot afternoon. The only time I’ve ever looked out from the top braches of a wilga tree without having first climbed the tree. Thousands of pelicans on the shores of Lake Narran – the manager told us the old birds come here to die. We believed him. Found an open space near the trucking yards and popped down. Stayed five days here. Plenty of hospitable folk and hordes of goats at Brewarrina. Motor boating, fishing, swimming, drinking and what have you. "What no flying?” Why yes, we were invited to a sports meeting 'way out'. All we had to do was head west, cross three rivers, and follow the fourth up for six miles – as simple as that. “Perhaps. A beer might help anyway”. “Looks a bit small,” says Jack. Tanks look a bit low too, we thought. Perhaps we conjured up thoughts of those flaps and brakes that had so far eluded aeroplane designers. We got down - and flew to such purpose that afternoon that I nearly ran out of flight tickets. The flight back to town! That was an unforgettable experience. The aeroplane rock-steady in the late evening sky at sunset with the darkening earth below. Under such conditions Jack was wont to put on full bore and pull back on the stick to hang on the prop and await the inevitable stall and plunge earthwards. The only thing bordering on aerobatics that I ever saw him do. We left our lady passenger here and Jack and I continued on alone to Bourke, a city described by Jack as full of camels and Afghans. This was hardly just, but in those days it was a shadow of its former days. Then to Nyngan where we greased on to a claypan near the town, where I nearly had to referee a fight between the quick-tempered Jack and a local resident who seemed to resent our dropping in from the sky. Across to Gilgandra by compass bearing. Then Bathurst – tricky place here among tall poplars. We made it again. Jack was a bit anxious about the take-off. He suggested that I, and our new passenger, a member of the Jones family, betake ourselves to an outlying field while he took off single-handed. However the outlying field simply refused to present itself so we all clambered aboard, waited for a puff of wind, raced down an incline, across a gully, the bounce from which probably assisted to make us airborne. Then over some frantic hens in a henhouse and out between the poplars, we were on our way to make the second crossing of the Blue Mountains by aircraft, keeping a weather eye on the railway tracks snaking their way among the ranges in case that oil drip got worse. Why, here we are at Mascot! Look at those two big canvas hangars and another machine like ours, but probably not so modern, parked in one. In our excitement the engine stalled and resisted all efforts to re-start it and we had to ignominiously do the last half mile on foot. After the welcomes we walked back to bring in the plane, only to find that someone had souvenired Jack’s helmet and glasses. The trip was worth a souvenir but my conscience is clear. The press thought us worth a story. We told them about the pelicans, coming home to die. Next morning’s issue said: “The bones of the birds could be distinctly seen from the air.” Freedom of the press indeed. CAPTAIN TREACY'S AEROPLANE "BOGGED" AT ASCOT RACECOURSE. and the machine came down in the middle of a swamp. The propeller was broken. The National Library has many more online newspaper articles about Jack's pioneering aviation activities.